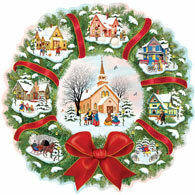 Christmas Barn is a 750 piece shaped jigsaw puzzle designed by artist Larry Jones. Everything to do with the holidays is for sale and both animals and people are welcome at this Christmas Market in the barn. A joyous place to purchase decorations, taste some treats and get in the spirit of Christmas. Available in two piece counts.